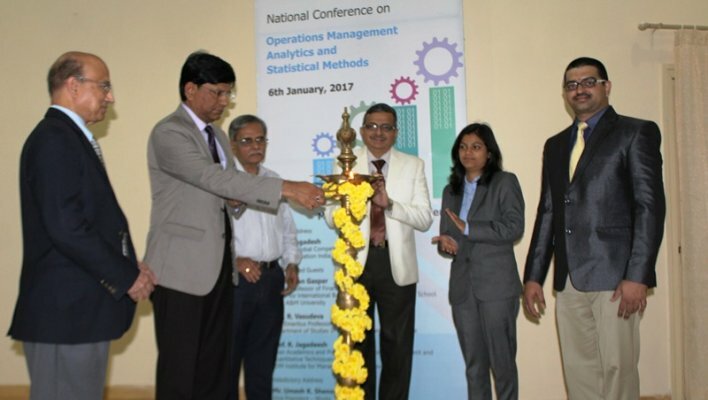 SDMIMD had organized a National Conference on Operations Management, Analytics and Statistical Methods on 6th January, 2017 with a theme “Moving Towards Excellence”. Academicians, research scholars, corporate executives, consultants, and management students from all the three areas had participated and presented papers during the conference. Mr.R.C.Jagadesh, Director-Global Competence Center-Cement Industry Kluber Lubrication India Private Limited, had delivered the keynote address. Dr. Julian Gaspar, Clinical Professor of Finance & Executive Director Center for International Business Studies, Mays Business School Texas A&M University and Prof.Vasudeva, UGC Emeritus Professor were the distinguished guests for the session. The valedictory function was held in the evening and Mr.Umesh K.Shenoy delivered the valedictory speech. Dr.Srilakshminarayana, Conference chair proposed the vote of thanks. Dr.R.Jagadeesh-Dean Academics, SDMIMD was the distinguished guest for the session. Dr. N. R. Parasuraman, Director – SDMIMD, Dr.H.Gayathri, Deputy Director-SDMIMD, Prof. Rajendra Todalbagi, Conference Co-Chair, and other faculty members of the Institute were present.